Indiana colleges are finding ways to draw more students in a time when national enrollment numbers are trending down. Some universities reported record-setting numbers of incoming freshmen in 2018, attributing the increase in part to reaching out to more students living in other states. Offering classes online makes that possible; both students living in Indiana and those from across its borders are taking advantage with up to a third of the student body at the University of Indiana taking at least one class online. 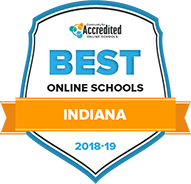 Learn how you can take advantage of the online degree options at colleges and universities in Indiana below, with answers to important questions on how to compare schools, pay for online credits and more. For this year’s college rankings, our analysts carefully reviewed statistical data from multiple sources for more than 7,500 postsecondary institutions so that you could easily evaluate schools based on what matters most to you. For each school, we applied the eligibility criteria outlined below, then ranked schools and programs based on four ranking factors. Located in the city of Bloomington, Indiana University is the flagship post-secondary institution of the Indiana public university system. UI Online, the university's distance-learning portal, is home to more than 120 online degree programs offered in 16 major fields of study. The vast majority of degree and certificate programs can be completed fully online. Students are typically required to complete course assignments within a given timeframe, but in most cases, classes are presented in an asynchronous format, meaning that students can access and complete their coursework at any time of the day or night. Ball State University is a public research university located in the central eastern Indiana city of Muncie. Over 70 degrees (associate to doctoral), certificates and educator licenses can be earned through Ball State Online, the university's distance-learning program. While many degrees and certificates can be completed fully online, others require some level of on-site attendance on the university's main campus in Muncie or at Ball State's Indianapolis Center. Ball State Online students have access to an extensive array of student support services, including academic advising, peer mentoring, technology support and career planning. Grace College & Seminary is a private evangelical Christian institution located in Winona Lakes, Indiana. Grace College Online offers a variety of distance-learning degree opportunities on both the undergraduate and graduate levels. Its GOAL (Grace Opportunities for Adult Learners) program was developed for students balancing work and personal commitments while pursuing college degrees. GOAL students can choose from among bachelor's degree programs in management, quality management, human services and business administration. In addition to GOAL degrees, Grace College offers hybrid-format bachelor's degree completion programs in psychology and ministry leadership, as well as 6 master's degrees in a variety of study fields. An Associate of Science in liberal arts is also available. An educational powerhouse with a worldwide reputation, Purdue University is home to two major distance-learning programs: Purdue University Online and Purdue Global. Through Purdue University Online, students can choose from more than 20 master's degrees and several graduate certificate and professional development programs that can be completed either fully or partially online. A single associate degree is also available through the Veterinary Technology Distance Learning Program. Purdue University Online does not offer bachelor's degrees. The mission of Purdue Global is to deliver "personalized online education tailored to the unique needs of adults who have work or life experience beyond the classroom." Students throughout the world can choose from dozens of degree options - from associate to doctorate - in a wide range of subject areas. Along with its online presence, Purdue Global operates on physical campuses in 7 states. Located in the northwest Indiana community of Mishawaka, Bethel College is a private liberal arts college affiliated with the Christian Missionary Church. Bethel College offers a limited number of degrees that can be earned 100% online, including bachelor's degrees in business, nursing RN to BSN and Christian leadership, as well as an interdisciplinary studies program that allows the student to customize a curriculum based on his/her interests. Master's degrees in business administration, counseling, education, ministry and teaching, along with a school administration licensure, are also available in a fully online format. A BS in behavioral and social science, and a Master of Arts in counseling are offered in an online/on-site hybrid format. Oakland City University is a private, coeducational institution located in Gibson County in southwest Indiana. It is the only college in the U.S. affiliated with the General Baptist Church. OCU Online, Oakland City's distance-learning program, offers a small number of online undergraduate and graduate degrees in the fields of criminal justice, education and, most prominently, business administration and management. An online Associate of Arts in Christian studies is also available and is designed to be completed in as little as 24 months. Saint Mary-of-the-Woods College is a private, 4-year, Catholic college located north of Terra Haute in eastern Indiana. The College's Woods Online program offers over 20 associate, bachelor's and master's degrees that can be completed totally or partially online. Among the major fields of study offered are accounting, business administration, criminology, art and music therapy, theology and many others. SMWC additionally offers alternate programs in specific education topics that can be earned via distance learning. Indiana University-Purdue University Indianapolis (IUPUI) is a public research university located in Downtown Indianapolis that offers degrees from both Indiana University and Purdue University. IUPUI's distance-learning programsponsors and extensive line of degrees and certificates, the vast majority of which can be earned entirely online, with others presented in an online/on-site hybrid format. Bachelor's, master's and doctorate degrees are available in a broad range of fields across the entire arts and sciences spectrum, and 2 associate degrees in the subjects of histotechnology and labor studies are also available in fully online formats. Through Indiana State Online, ISU's distance-learning portal, students can choose from among more than 70 undergraduate and graduate degree, minor and certificate programs that can be completed 100% online or with minimal on-campus attendance. Programs are available in a variety of study fields, including business and marketing, criminology and criminal justice, education, engineering, nursing and many others. All online programs are available in Indiana, but program availability may be limited in other states or outside of the U.S. Out-of-state students can check program availability and review important licensure and certification information for their locations here. The University of Southern Indiana's Online Learning program offers a number of undergraduate and graduate degrees that can be completed either fully or partially online. Areas of study include nursing and health services, sports management and business administration (with 5 available MBA concentrations). All bachelor's degrees are offered in a degree-completion format, allowing full-time students to finish their major coursework in 1 to 2 years. Non-degree programs are available in advanced studies in addiction science and certification/continuing education for health professionals. How can I find which online colleges offer the degree I’m looking for in Indiana? Because online programs are constantly changing, adapting and being added, the best place to look for up-to-date information on degree and major options is a college’s Online Program Directory. On these pages, colleges such as Purdue University list their traditional degree programs as well as professional development programs offered via distance learning. Indiana University’s online portal even has a search tool to help you sift through more than 120 online programs based on your education goals. Learn More Indiana has an interactive test to help you align your interests with a career. Many online colleges in Indiana, like Indiana Wesleyan University, offer course listings categorized by degree type. Which online schools in Indiana will accept my transfer credits or work/life experience? Before you commit to an online program in Indiana, you should confirm the transfer policy at the school you plan to attend—policies will differ, sometimes greatly, between schools. Know who to call at Indiana colleges and universities to discuss your credits and be prepared to request copies of your transcript. Credits from another accredited Indiana college are likely to transfer. According to the 2018 State of Higher Education Address from the Indiana Commission on Higher Education, colleges in the state are creating easier routes for students to earn and transfer college credits. For example credit assessments including portfolio analysis, test evaluations, prior certifications and military experience are all valid transfer credit possibilities at the University of Indiana. How Much More Do College Grads in Indiana Make? According to a 2018 Gallup Poll for the Indiana Commission for Higher Education, 79 percent said their education was worth the cost, and 72 percent said their college prepared them well for professional life. Based on the above table, people working in jobs that require a master’s degree in Indiana only make slightly more than those in bachelor’s degree level fields in the state. But the wage gap becomes significant as you compare positions that require more advanced degrees against jobs requiring an associate degree or less. According to the Indiana Department of Labor, the leading industries in Indiana include aerospace and aviation, cybersecurity, energy, transportation and life sciences, among other innovative fields that require higher education for entry-level positions. Regional Accreditation Educational standards for the state of Indiana are regulated regionally by the Higher Learning Commission. Other colleges that fall under the HLC’s jurisdiction are located in the following 19 states: Arizona, Arkansas, Colorado, Illinois, Indiana, Indiana, Kansas, Michigan, Minnesota, Missouri, Nebraska, New Mexico, North Dakota, Ohio, Oklahoma, South Dakota, West Virginia, Wisconsin and Wyoming. National and Specialized Accreditation As a bonus, some schools also apply for additional, subject-specific accreditation in specialized fields. This assures individual programs meets industry standards, such as Ball State University’s additional accreditation in the Miller College of Business by the Association to Advance Collegiate Schools of Business or Indiana State University’s Clinical Psychology program accreditation from the American Psychological Association. Flat-Rate Tuition: Some universities charge flat-rate tuition while others charge per credit hour, such as WGU Indiana, where six-month terms are billed as flat-rate tuition, so students pay per term rather than per credit hour. Resident and Non-Resident Rates: Much like on-campus tuition rates, some of Indiana’s online college charge different rates based on residency status, such as the Indiana University East. Rates Varied by Subject: At Indiana Tech, online tuition rates are different based on the subject you choose to study. What are Indiana’s requirements to qualify for in-state university tuition? Indiana is one of 12 states that is part of the Midwestern Higher Education Compact. If you live in one of those states, you may qualify for a tuition break and have an easier time transferring credits. Purdue University details resident classification for tuition purposes. At Indiana University-Bloomington, total direct costs for Indiana residents is approximately $21,000 while non-residents pay $45,000. If you live in Indiana for 183 days, you qualify as a resident. However, if you register to vote in Indiana, you qualify as a resident after a 27-day wait. Are online credits more affordable in Indiana than other places? How can I get help paying for online college in Indiana? According to a 2018 study by the Indiana Commission for Higher Education, nearly one-third of Indiana public graduates received financial aid from the state’s aid program. Check which schools are eligible to receive state aid for students through this database, courtesy of the Indiana Commission for Higher Education. If you’re an Indiana resident, you may be eligible for scholarships through the state’s Division of Student Financial Aid. There are several program-specific and demographic-specific scholarships, such as grants for women, nursing, or for U.S. Military Veterans. It is never too late to learn something new or pivot in your professional endeavors, but many people are discouraged from attending college because they have been away from school for a long time, or may not have had success with school in the past. Statewide, there is a significant investment being made into professional development and education from industries fueling economic growth. Adult education programs may be able to provide the support and starter education you need to jump-start a college career. College and Career Planning The adult education portal provides a free college and career research tool on the Indiana state website. High School Equivalency – If the first step towards college is earning a high school certificate, Indiana’s HSE programs for adults can help. Language Programs – For students from other countries, English as a Second Language programs are a part of adult education in Indiana. The Indiana Adult Education Program has served more than 28,000 students statewide. To find a program near you visit the Indiana Department of Workforce Development website.